The Extraordinary World of Charles Waterton at Wakefield Museum01924 305356work MuseumVisitors to Wakefield Museum can take a trip to the extraordinary world of Charles Waterton - a pioneering Victorian eco-warrior, explorer and Yorkshireman. Waterton's interest in wildlife seems to have started when he travelled to Guyana and Brazil where he saw exotic species such as chameleons, lemurs, sunbirds and alligators. When he returned to Walton Hall, Wakefield, in 1820 he dedicated his life to observing and protecting the local wildlife, and created what is said to be the world's first nature reserve. He built a stone wall stretching over 3 miles around the Walton Hall Estate to keep poachers out and the wildlife in. To encourage more birdlife he planted trees and left hollow tree trunks and branches for nesting birds like barn owls. Artificial nest boxes (again, another world's first!) were built for owls, sand martins, jackdaws and starlings. He bought a telescope to watch wild birds and Wakefield Museum is now home to Waterton’s collection of preserved animals – some of which are made up from different animal parts! See exotic birds, monkeys, a snake, anteater and sloth. 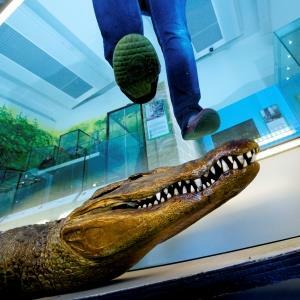 The star attraction being the amazing Cayman crocodile which he rode ashore in South America! Visitors to Wakefield Museum can take a trip to the extraordinary world of Charles Waterton - a pioneering Victorian eco-warrior, explorer and Yorkshireman. The Waterton collection is on loan from Stonyhurst College.